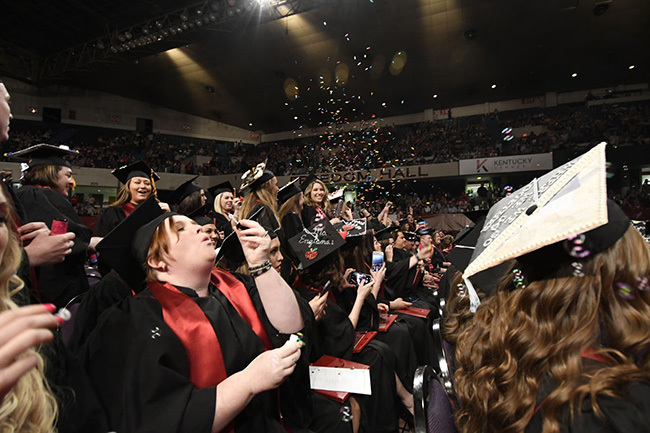 Graduates celebrate at the IU Southeast 2018 Commencement. NEW ALBANY, Ind. – According to the results of the second Gallup-Indiana Graduate Satisfaction Survey released today by the Indiana Commission for Higher Education, Indiana University Southeast produces some of the most satisfied alumni with 89 percent indicating that they are satisfied or extremely satisfied with the education they received. The survey reached out to more than 21,000 college graduates from 12 Indiana colleges and universities including: Ball State University, Butler University, Calumet College of St. Joseph, Grace College, Indiana University Southeast, Indiana University-Purdue University Fort Wayne, Ivy Tech Community College, Marian University, Purdue University Northwest, Taylor University, Vincennes University and WGU Indiana. IU Southeast alumni rank their satisfaction higher than the average for other institutions in the state with 88 percent of respondents indicating their education from IU Southeast was worth the cost versus 80 percent among all college alumni surveyed and 72 percent of IU Southeast respondents felt they were well prepared for life outside of college. For more information, see the IU Southeast 2018 Undergraduate Alumni Scorecard.